It was an even split between government-owned and privately run clubs as Insurance of Benin (government owned) and Kada City of Kaduna (privately run) topped their groups to seal promotion to the Nigeria Professional Football League (NPFL) where they will be joined by Remo Stars (privately run) and Gombe United (government owned) after the group stages of the Nigeria National League (NNL) Super Eight playoffs were decided in Aba on Wednesday 9, January. The “Benin Arsenal” are making a return to the top flight following an eleven-year absence while Kada will be making a maiden berth in the top tier. Remo Stars and Gombe United are back after a year away after both teams were relegated from the top flight at the end of the 2016/2017 season. For a process designed to produce teams that will compete in the nation’s topmost ‘professional’ league, Wednesday’s fixtures betrayed a staggering lack of professionalism and organisational foresight with the NNL showing a healthy disdain for the basic notions of competitive transparency and fair play. 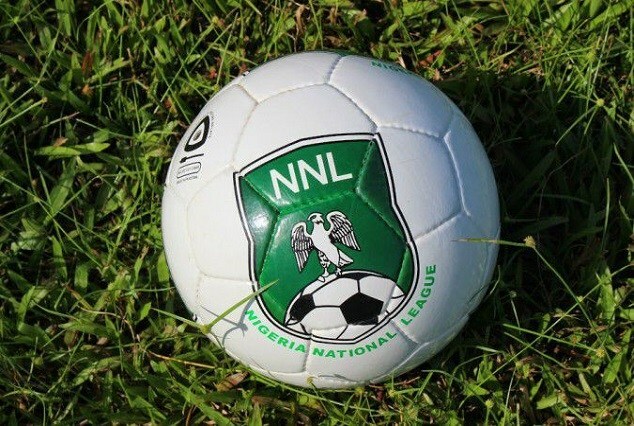 With all eight teams involved still in with a chance of securing promotion to the NPFL ahead of the final round of group fixtures, one would have thought the NNL would have shown a bit of common sense in ensuring all games were played concurrently. What ensued instead was a farcical situation where teams took to the pitch fully armed with the advantage of having foreknowledge of their competition’s results. It was a charade that made a mockery of the fundamentals of sporting competition and the NNL now wide open to accusations of compromise ought to be ashamed for overseeing thes shambles. Not that Insurance – who had the sports-crazed deputy governor of Edo State Phillip Shuaibu listed among their substitutes – would mind. The team from Benin put paid to Shooting Stars Sports Club hopes of making a return to the top flight when club stalwart Charles Omokaro struck a beauty from 25 yards to seal a one nil victory for Insurance. It was fitting that Omokaro who top-scored for the club in the season they went down nearly eleven years ago and who has been with the club ever since would score the goal that sealed their return to the top flight. Although the Benin Arsenal had Michael Enaruna sent off for two bookable offences, Shooting Stars who had three points from their first two matches, couldn’t capitalise on their man advantage as the parsimonious Insurance defence – yet to concede a single goal in the Super Eight – held out for a third consecutive victory, a place in Thursday’s final and more importantly for Monday Odigie wards, a return to the NPFL after over a decade. Earlier in the first match of the day, Kogi United defeated Real Stars of Kaduna 2 -1 at the Enyimba International stadium. John Jerome and Ibrahim Enese with his second of the tournament scored either side of half time to put Kogi two goals up with Ansaru Abubakar netting a consolatory effort for Real Stars late in the second half. Both teams had gone into the match level on one point apiece and victory for either side in their final game would put them level on four points with Gombe United and Kada City who were top of the group on goal difference and were scheduled to play next. Kogi’s victory put them on four points but their goal difference of -2 meant they were third on the log behind Gombe and Kada who had a goal difference of +1 and +3 respectively. All Gombe United and Kada City had to do therefore was to play a draw of any description to secure promotion to the NPFL which they duly did; going through the motions to record the only barren encounter at the tournament so far. Kada City top the group and face Insurance in Thursday’s final while Gombe United make a return to the NPFL. Remo Stars rounded off the day’s action against Delta Force who with zero points and a minus five goal difference remarkably still had a chance of securing promotion to the top tier. Remo Stars on three points and a +2 goals difference after a loss to Insurance and a victory over Shooting Stars in their two group matches needed just a draw to secure promotion behind Insurance who had earlier defeated Shooting Stars to leave the Ibadan team on three points and a -2 goals difference. Delta Force, therefore, had to defeat Remo Stars by five clear goals to leapfrog them in the standings and for a team that had yet to score a goal at the tournament it seemed a particularly steep task the angle of which was made even more precarious when they conceded in the 20th minute to a strike from Idris Aloma who was making his first appearance for Remo in the competition. Force however rallied and were level in the 40th minute after Osita Egbo dispatched a well taken penalty to record their first tournament goal following a foul on Obinna Awara in Remo’s box. That, however, was as good as it got for the Deltans who should have fallen behind after Mustapha Gbolahan could only put his shot wide with the goal gaping after he had rounded the goalkeeper. He, however, made up for his miss when he set up Victor Mbaoma to net the winner for Remo in the 71st minute. Remo finish second on six points behind Insurance of Benin who topped the group on nine points. Delta Force meanwhile leave the competition with zero points and a solitary goal from three matches. The NNL Super Eight concludes on Thursday, 10 January in a display of government might versus private industry when the Edo State owned Insurance of Benin take on the privately run Kada City in the final at the Enyimba International Stadium, Aba.